Rabbi Gifter is settling in to his seat on a plane...the passenger next to him looks over, notices him and says something along the lines of "...great, another one. You Jews are everywhere. "...Rabbi Gifter, without missing a beat, looks over and calmly responds "try Hell, there are no Jews there." Here is a Rav Gifter story that I heard from one of his talmidim (perhaps it doesn't belong on the list, but I like it): Rav Gifter, towards the end of his life, was tormented by Alzheimer's disease. Slowly he lost all of his ability to construct coherent Torah thoughts. One day, word went around the yeshiva that Rav Gifter was going to give a shmuess; there was great excitement, since the Rosh Yeshiva had been unable to organize his thinking for quite some time. The beis medrash was packed. Rav Gifter got up and began to speak. After just a few sentences he went silent. Several minutes passed without a sound before the Rosh Yeshiva began to sob. Through his cries he begged his yeshiva to pick a mesechta, learn it through and through, and chazer it many times so they could truly acquire it. 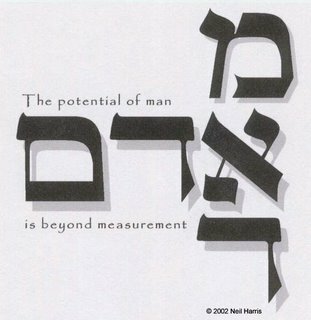 This inspires me because it shows that a person is capable of developing such a deep love for Toras Hashem that its loss from the consciousness causes extraordinary emotional suffering. It also reminds me that I need to chazer my learning more! You can't forget the one about R Moshe Feinstein's brand new set of shas and the bochur who tried to sneak a peak and spilled ink all over one of the volumes. I think Rav Moshe's line was something like "It looks better in blue". A young man comes to Rabbi Gifter complaining that his wife bothers him with menial tasks around the house, tasks that he feels as a ben Torah are beneath him "..for example, she wants me to take out the garbage!" The next day there is a knock at the door of this young man's home. Rav Gifter is standing in the doorway...he tells the young man that it is absolutely beneath such a ben Torah to take out the garbage...to make sure that he doesn't have to Rav Gifter says that he will be taking out the garbage! What about the famous Rav (who nobody can positively identify) who cursed mishpachas Kennedy? * The rabbi who brought his wife to the doctor because "our arm hurts". * Someone gossiping on a train ride about the inadequacies of a certain prominent rav to a stranger, then showing up at his shiur to find the stranger is that rav. Anonymous - I believe that you're story is actually about Rabbi Jacob Joseph who was the first and last chief Rabbi of NYC. (He died in 1902. The Famous Rav who cursed the Kennedys was a Lubavitcher Rabbi, not the Rebba but a Rabbi (while on a boat leaving England towards American - I think).It was as a response to many of Joe Kennedy's Anti-Semitic Decisions as the Ambassador to GB. * The bochur-later-to-be-a-Gadol who kept coming late to morning shiur, and explained that he was helping a woman take care of her large family. He gets praised for this, and then when asked who the woman is, it is his wife. There is also the R' Chaim Kinievsky Dating story. He came to date his wife and he was exausted. He ended out falling asleep while on the date. His "date" was confused ~ in the end the reason why he was so tired was because he realized that the benches on the train that he was taking were shatnez so he stood the entire trip. Halachikally it is ok to sit on Shatnez. It is the message that is always given over after this story that is the most important. That might be a Berel Wein story. The Steipler (I think) being in the Russiona army and being for ced to take target practice on Shabbos...the only way he could figure to mitigate the issur was to shoot with a shinuy, so he woould aim and fire with his rifle upside down...(big finish)AND HE STILL WAS ABLE TO SHOOT PERFECTLY!! The Steipler still in the army...had to stand guard during a cold winter Shabbos evening...shows up to his to find that the previous soldier had left the coat reserved for the watchman hanging ona tree branch...unwilling to mechallel Shabbos and remove the coat from the branch he stood guard the entire freezing cold night without the aid of a coat...this was thought to be the cause of his hearing loss (I think). The guy who stands ontop of his house declaring that Hashem would save him....one time after the next. he even turns down a helicopter...then he gets the heaven and he is told that each of the boats and helicopters were sent by HAshem. "The rabbi who gave a questioner money for meat and wine when he asked a shaiyla about substituting milk for wine at the seder"
One of the many unfortunate consequences of Jews having lived among hostile populations is that many Jews have developed an "exile complex", manifested by self-effacement and subservience. ''I'm sorry, mister," I said to the man. ''I'm not Jewish. I'm Amish, and this is how we dress." The man became apologetic. "Oh I'm terribly sorry, sir,” he said. "I did not mean to offend you. I think you should proud of preserving your traditions." "Well, well," I said. "If I am Amish, then my beard and black hat doesn't bother you, and I should be proud of traditions. But if I am Jewish, then I must be ashamed of my Jewishness? What is wrong with you that you can respect others but have no self-respect?" The time has certainly arrived when we ought to be proud of our heritage, of who we are, why we are, and what we are for. When Rav Dessler came to America in 1948, he met up with his son, Nachum Velvel in New York. Rav Dessler asked his son who had help him during his years alone in America? His son mentioned several people in New York along with Rabbi Eliezer Silver, the head of Agudah Israel and the rav of Cincinnati. Rav Dessler said, "We must thank him." His son offered to place a telephone call to Rabbi Silver, but Rav Dessler wanted to show personal hakaros hatov to Rabbi Silver. Nachum Velvel and his father then took a nine hour train ride to Ohio, arriving at 5:00 am in Cincinnati. Then went to Rabbi Silver's home and waited on the porch to meet Rabbi Silver as he left his house for davening. Rabbi Silver met his two guests when he woke up and they all went to shul and then back to the Silver's for breakfast. After a bite to eat, Rabbi Silver said, "So, Rav Dessler, what brings you to Cincinnati?" Rav Dessler said that he had only come to show appreciation to Rabbi Silver for all he had done for his son. Rabbi Silver thought about this and again asked, "So, Rav Dessler, what really brings you to Cincinnati?" Rav Dessler said that he had no other purpose that to show hakaros hatov. Rabbi Silver asked, "Rav Dessler, what can I do for you?" Rabbi Silver finally gave up and muttered, "This must be mussar." The Chazon Ish's mother, when asked how she merited having such a son, said it was due to her strictness of not uncovering her hair. "Even the walls of my most inner rooms have never seen my head uncovered!" she supposedly said. I heard this one endlessly, although looking back, I'm not sure why they told this to guys so much. @The Hedyot: I thought that was Kimchit from the Talmud, whose walls never saw her bare head. Found it: Yoma 47a - Kimchit who had the merit of seven sons who served as Kohain Hagadol, and attributed her scrupulousness in covering her hair as the reason to have merited such an honor. "Marc Shapiro wrote something about gedolim stories: since a lot of them aren't necessarily historically accurate, he said the stories we tell say more about the people that tell them, than they do about the person the story is purported to be about. but why do we tell the stories we tell? because they reflect values we admire, so stories survive by OUR choosing." Oheiv Yisrael/Gerrer Rebbe taught that each parasha contains a lesson in Ahavat Yisrael. When asked to explain where in Parashat Balak that concept is to be found, he replied that the parasha's name, BaLaK is an acronym for V'ahavta L'reiacha Kamocha. He was then challenged on the fact that the acronym is misspelled --that a vav/vet and a kuf/kaf transposition are required to make the 'acronym' work. To this he replied: "When it comes to Ahavat Yisrael, one is not permitted to be makpid on otiot." That story of the shidduch is with R' Chaim Kaniefsky's father, the Steipler. How about the one of the Chofetz Chaim running after the gonif saying "I forgive you", and the follow up with tne gentile judge "they don't tell such stories about me and you". ...and the one about the rabbi who challenged a Tzar (or other government official of extremely high rank in an oppressive country) to ask a soldier to obtain cigarettes, which it only took an hour, despite the fact that the country banned them. He then asked the soldier to find a crust of bread in the home of the Jews during Passover, and none could be found. Funny, I orignally was going to post, "they don't tell such stories about me and you", as well. I would have loved to be in that court case. I never got the "they don't tell such stories about me and you" thing; since people don't tell contrived happenings about me, but they do for him that is somehow a reflection about that person's inherent greatness??? IIRC, the situation (if anyone wishes to correct my memory, please do so)was that the CC was brought in as an witness in a court case. Someone questioned the character of the CC and another person, in the position of a character witness for the CC, said that someone once did something wrong to the CC and the CC ran after this person (for some distance) uttering, "I forgive you! I forgive you". Then this person telling the story commented to the judge, "they don't tell such stories about me and you". There are things that we, today, take as a given...for example the whole concept of a "yeshiva bachur" dressing nicely (or even in a dress shirt and slacks). 75-100 years ago, this wasn't always the case. That's why, from my understanding, the big move for students to 'dress nices' was a chidush that started in the mussar yeshivos (Kelm, at first, and then Sladbodka and Novardok). To us it might make sense to run after someone to let them know that you "mochul" them. Back in the 1920s, again, that might have seemed out of the ordinary. The Kimchit story raises my wife's hackles. I mean, think about it. Seven sons who all served as kohen gadol? So one after another they died, or got mumin, or became aveilim themselves, and lost the kohen-gadol job? Seven sons who die young, or get injured, or lose relatives in short order, and this is a reward? Sounds more like a punishment to me.